Details of the tragic Stoneman Douglas High School shooting are still unfolding. We know now that 17 people were killed and the suspected killer is in custody and is facing 17 counts of murder. However, much of the political conversation has not acknowledged the need for some level of gun control in the country. In response to that, some high school students from South Broward High School, just about 50 miles from Stoneman Douglas, staged a walkout to protest for gun control and school safety Friday morning—and most of them aren’t even old enough to vote yet. 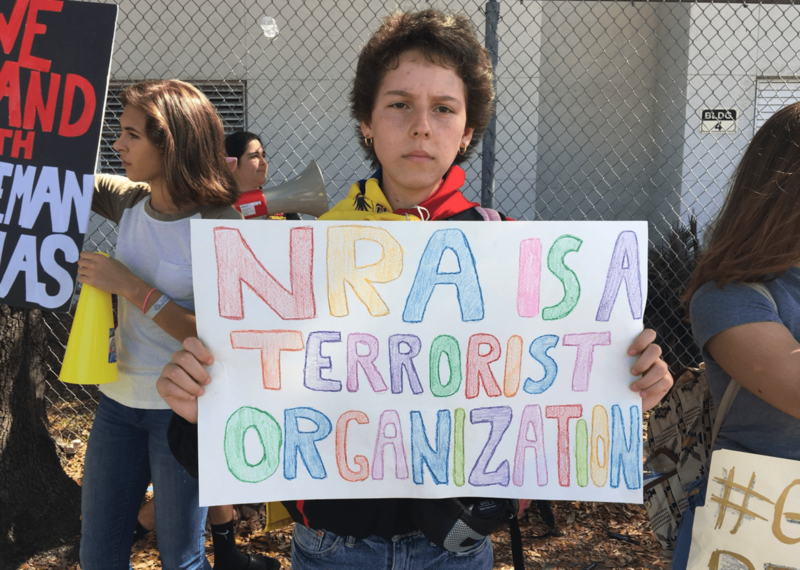 Sara Rodriguez, the teen holding the sign that said “NRA is a terrorist organization” told HuffPost that she wants gun violence to end and believes policymakers and adults have “absolutely” failed her generation. This is happening as the Federal Bureau of Investigations is under fire for having essentially ignored specific tips about the killer last month. Florida Governor Rick Scott is calling for FBI Director Christopher Wray to step down.